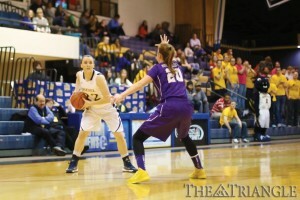 Freshman guard Meghan Creighton has started all 29 games this season for Drexel. Creighton averages 6.2 points, 2.2 rebounds and 2.4 assists in 29.3 minutes per game. This proved to be a defining week for the Drexel University women’s basketball team, as they faced the two teams most likely to stand in their way of winning a Colonial Athletic Association championship. First, the No. 18 nationally ranked Blue Hens of the University of Delaware squeezed out a 62-57 victory at home against the Dragons to end their four-game winning streak. The first half was tightly contested between these two top teams. Delaware started the game on an 11-2 run. However, the Dragons fought back thanks to senior Hollie Mershon and freshman Meghan Creighton, who sank a three to make it 11-8. The back-and-forth affair kept going throughout the first half, and the Blue Hens went into the intermission with a slim 26-25 lead. Coming out of the first half, the Dragons started slow. Delaware went on a 26-15 run midway through the second half to go up to 52-40. At that point Mershon and freshman Rachel Pearson started to heat up. Pearson scored nine points, all of which came within the last six minutes of the game as part of a 17-5 run by the Dragons. Mershon had eight points as well in that stretch. The Dragons continued to fight, and a Mershon three-pointer at the 3:10 mark tied the game at 54-54. In the teams’ previous matchup, Drexel’s main priority was to contain All-American Elena Delle Donne. On this occasion, however, it was fellow Blue Hen Lauren Carra who helped close out the game for Delaware. Carra hit a three with under two minutes to go to give Delaware the lead. Pearson came back on the other end and hit a three-point shot to tie the game once more. However, Carra went to the free-throw line four times within the final two minutes and hit all four shots. Delle Donne hit a two within the final minute of the game to seal the game for Delaware. Mershon scored 26 points in the game. It was the most points allowed to a single player by Delaware’s defense in over a calendar year. The key to the game for Delaware was second-chance opportunities. Delaware had 16 offensive rebounds and 17 second-chance points. The Dragons could manage just nine offensive rebounds and five second-chance points. Drexel looked to conclude its regular-season schedule at home on Senior Night against James Madison University. Unfortunately for the seniors, JMU had other plans for the evening, as they defeated the Dragons 62-53 at the Daskalakis Athletic Center. It was an off night shooting for the Dragons, as they only shot 33 percent from the floor the entire game. Aside from Mershon, who had 27 points in the game on 50 percent shooting, no other Dragon could get into a flow and truly have an effect on the game. Despite being down by as many as 14 points in the game, the Dragons, as they have done all season, did not quit. They fought back and got within six points when the score was 40-34 in the second half. However, the lack of offensive production from other players hurt the Dragons’ ability to complete the comeback. Senior Taylor Wootton recorded 12 points and two blocks in the game. “If we are going to rely on [Mershon], then the other team’s mentality is that one player can’t beat us,” head coach Denise Dillon said of the Dragons’ stagnant offense. Despite losing the game that locked up the No. 2 seed in the CAA Tournament, for JMU, Dillon said she still believes this team can go all the way, especially because of the way it has competed in every game. Dillon credited the competitive nature of the team to her four seniors: Mershon, Wootton, Renee Johnson-Allen and Nicki Jones. “This group of seniors is by far the most special group. They bought in from day 1, have given everything to this University, and we like to see them succeed and do well,” Dillon said about her senior class of players. The Dragons will be preparing for the postseason as the CAA Tournament starts March 15 against The College of William & Mary.